The Électrons Libres, is a group of chefs that are as individual or as leaders of a group have taken a unique route that goes beyond the learning process. Their philosophy transforms the cuisine of the present time as well as the cuisine of the future in a specific area (place) or country. Sometimes they are the leaders of a culinary movement but often, they are alone in their search. Carlo Cracco is a good example of an ‘’Électron Libre’’. For the last few years, after is apprenticeship with the master Gualtiero Marchesi, he has transformed the contemporary Italian cuisine by mixing the traditional, the technology and by adding a ‘’touch of madness’’ (his own words). He is a lot more than an emerging chefs, he is the leader of the new group of Italian young chefs. Born in Vicenza in 1965, Carlo Cracco attended the “Instituto Professionale Alberghiero” (Professional Hotel Institute) in Recoaro Terme near Vicenza (North Italy). In 1986, he began his professional career in Milano with his mentor Gualtiero Marchesi. The following three years, while in Paris, he learned more about the French cuisine under Alain Ducasse and Lucas Carton. He eventually came back to Italy and worked like the chef of Enoteca Pinchiorri (Florence) and later on at L’Albereta and Erbusco under chef Gualtiero Marchesi. In 2001, he accepted Stoppani family’s invitation (famous gourmet shop Peck) and opened Cracco-Peck Restaurant. 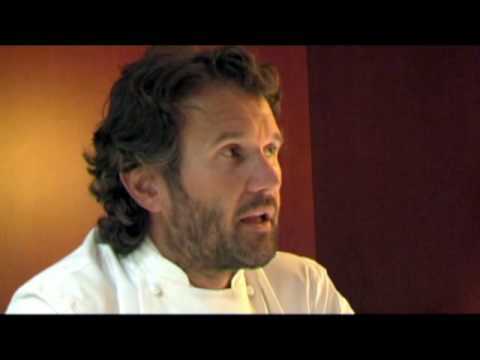 Carlo Cracco has been the sole owner of Ristorante Cracco since July 2007. The cuisine of Chef Cracco has a strong Italian base, but it is also very original and highly creative. 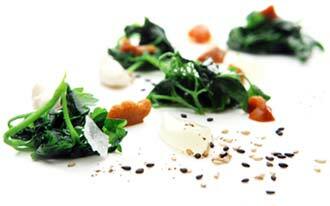 He likes to create Italian dishes with a wide range of products, textures and aromas. Just look at the recipe of Oysters and Mozzarella di Buffala, Crème Brûlée with Olive oil with Oil butter, Risotto with Lemon, Anchovies and Cocoa (to name a few). When you see his creations or read the names of his dishes, it is easy to understand ‘’the madness touch’’ and easy to understand that his cuisine is all Light and Shadows! CCracco- My cuisine for me is lead by the produce. The ingredients with i work must be the best ingredients – seasonal and at their best. At Ristorante Cracco, we tell our guests where their food comes from, how it is produced and, most important of all, why it tastes as good as it does. We put a lot of effort into sourcing and our customers want to know. For instance, Risotto alla Milanese with bone Marrow is a basic, elegant and beautiful dish. But, then for madness, I add the tastes and textures of veal kidney, sea urchin and morel mushroom. CCracco- I love playing with the sea urchins. CCracco- Gualtiero Marchesi has been my mentor and will always be. CCracco- Yes…the smell of the mould on a salame. 5-(Scoffier) What do you learned with the great chef Gualtiero Marchesi? CCracco- Thanks to him! I learnt to appreciate what I am working with, from produce to people. He gave me the chance to grow and put trust in me and now I am reflecting all this in my own brigade. 6-(Scoffier) How you construct your menu ? 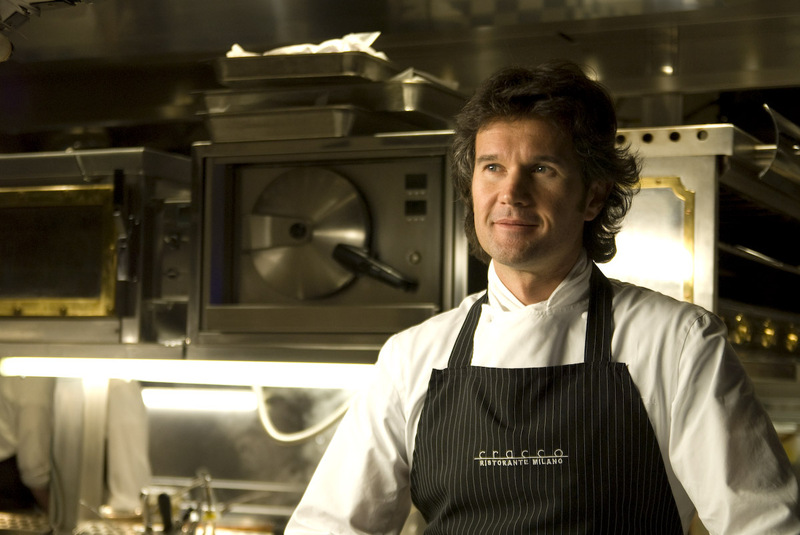 CCracco- I approached the creation of the dishes in the same way and using the same philosophy and style …. Eating is a very sensual experience and the environment, the design, the presentation sets the scene for the taste. 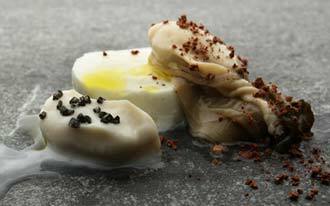 Again the flavours, the combinations and the textures of the food plays their part. 7-(Scoffier) I seen your menu at Ristorante Cracco, do you often change your tasting menu? CCracco- Yes, I do change it quite often. 8-(Scoffier) I know that the chef Pascal Barbot (L’Astrance) take a lot of time choosing and picking his products at the market. Do you spend as much of time to choose and pick your produces? CCracco- Well… I am luck to be surrounded by exceptional suppliers. I trust in their produces, however I like to pick and choose. 9-(Scoffier) I look at the photography of your dishes and you have a great aesthetics, it’s important for you and you are influenced by what; the arts, nature, Italy? 10-(Scoffier) Can you give us a detailed recipe (Signature or important dish) that is characterized the cuisine of Carlo Cracco? 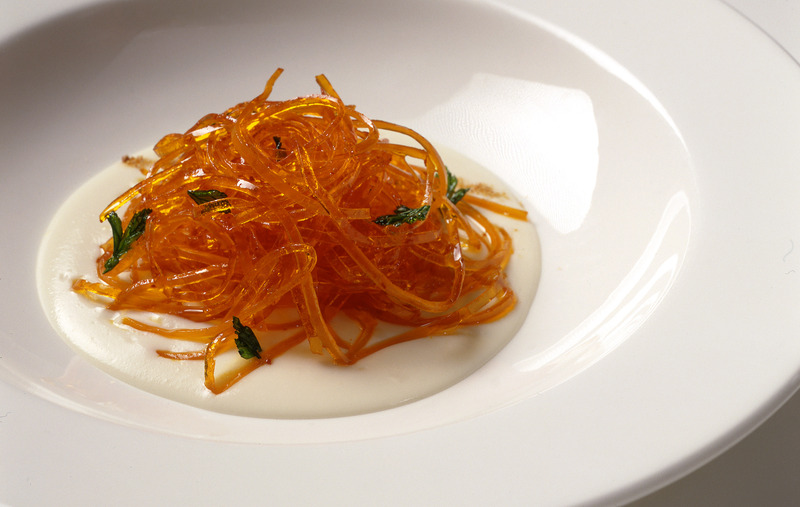 CCracco- Sure, see the recipe Egg Yolk Spaghetti, Aglio Olio and Peperoncino. 11-(Scoffier) What is your goal (ambitions) as a chef or for your restaurant? Do you think about write a new book, a television show, other restaurant? CCracco- To give at the people the pleasure. 1. Mix the smoked salt with the sugar and marinate the egg yolks for 4/5 hours. 2. Rinse them under cold running water. 3. Place the egg yolk beside one another between two baking paper sheets and spread them uniformly with a rolling pin obtaining a thin layer. 4. Let it air dry for 2 hours. 5. Remove the sheet from the paper and pass it through a pasta machine to make spaghetti. 6. Boil the garlic with the milk and reduce it to half volume on medium heat. 7. Pass the garlic and milk through a sieve, add a pinch of salt, obtaining a creamy garlic sauce. Leave it aside. 8. In a sauce pan, add some olive oil, the spaghetti and a pinch of chilli powder. 9. Stir it gently for a couple of minutes. 10. In a bowl, place some of the garlic cream and lay on top of it the spaghetti. 11. Finish with a fried parsley leaf and a drop of extra virgin olive oil. Serve!